Staying on the road | What Car? 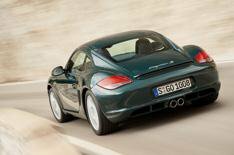 Not that its mere performance that makes the Cayman so enthralling. Unlike the 911, which has its engine out by the rear bumper, the Caymans engine sits amidships, giving a near-perfect front-to-rear weight balance. Whats more, because successive 911s have become progressively wider, the Caymans slim-hipped body makes it feel far more compact than its fat-bottomed cousin. Lash down a country road in the Cayman S and your thirst for more and more speed is almost insatiable, thanks to the immense confidence you gain from the huge levels of grip and the wonderful flat cornering attitude. Then add the virtually telepathic steering into the alchemy it lets you glide within a millimetre of cats eyes on the road and to kiss the apex of every bend. Youll end your journey with shivers running up your spine. Dont go thinking that your teeth will be chattering along with those shivers, though. Specify Porsches PASM (Porsche Active Suspension Management) system and you can leave the suspension in its default comfort-oriented mode and, along with the relatively high-profile tyres, the ride is nearly as cosseting as many a luxury cars (Sport mode is too firm for anything other than track days). Just as impressively, things are pretty civilised inside, because those tyres arent of the typically wide variety that send air-raid-siren levels of road noise into almost every modern supercar. The Caymans comparatively narrow tyres and resultant reduction in road noise make it an accomplished long-distance cruiser.